Earlier this month I had the pleasure of representing CyArk and Project Anqa at the second Culture in Crisis workshop at Yale University. 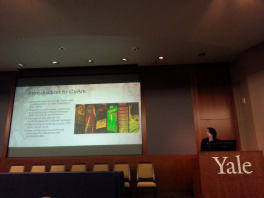 The event was an International Conference held at theInstitute for the Preservation of Cultural Heritage, Yale University, in collaboration with the Victoria and Albert Museum London under the patronage of UNESCO, satellite event to the UN Global Colloquium of University Presidents at Yale University. I presented in the Responses and Reaction session about Project Anqa, an emergency program for recording high risk heritage in the Middle East and North Africa. Project Anqa is named for the Arabic word for the phoenix, the bird that rises from the ashes. In June 2015, ICOMOS, by way of an MOU with CyArk launched Project Anqa, to deploy teams of international professionals, paired with local experts to digitally document at-risk sites in 3D before they are destroyed or altered. Yale’s Institute for the Preservation of Cultural Heritage (IPCH) joined Project Anqa as a principal partner to aid in scholarly online publishing of the resulting data. Together we are executing the first phase of Project Anqa which seeks to digitally preserve 12 sites in Syria and Iraq. In the second phase of the project we hope to expand the work throughout the Middle East and North Africa. This January we were able to advance Project Anqa through an initial training held in collaboration with UNESCO’s office for Safeguarding Syrian Heritage. We conducted a training for 5 Participants from the Directorate General of Antiquities and Museums of Syria (DGAM). The work was completed over 2 days at the UNESCO office 1 day on site at the Sursock Museum. This training represents the leap forward in the accessibility and ease of use of the technology. Over 3 days we were able to train the DGAM representatives to be able to successfully complete capture in the field. The trainees are now back in Damascus documenting priority structures and sending the data to CyArk for review. There is still much more work to do in Syria and beyond. With the recent retaking of Palmyra, accurate documentation of the current state of the monuments is essential in advance of any actions towards reconstruction. With this data captured, it opens up the possibilities of what we do with the information. The resulting engineering grade data can of course be used to create dimensioned drawings to inform reconstruction at the site. But is can also be used to create rich visualizations of the site and be made available for international scholars to study. Perhaps most exciting are the possibilities in virtual and augmented reality. We are only scratching the surface of what we will be able to do with the data. By capturing and archiving the data now, we are creating a time capsule of sorts, which can be revisited and reinterpreted well into the future. The Culture in Crisis workshop offered an opportunity to not only connect with project partners at Yale and ICOMOS, but it also afforded an opportunity to connect with potential collaborators from UNESCO, African ministries of culture, and complimentary heritage organizations like the Getty Conservation Institute and the World Monuments Fund.